The Cleveland Browns signed veteran quarterback Josh McCown on Friday. “Josh is your consummate professional,” Browns general manager Ray Farmer said in announcing the move. “He’s known to be a great guy in the locker room and will be great for the quarterback room. He knows how to get an entire offense on the same page and get a team to rally behind him. He has been exposed to a lot of different types of offenses and we think still has the drive and skill set to be a successful quarterback in this league. Good for Farmer for being able to say all that with a straight face. As to the part about bringing “winning football to Cleveland,” we’ll return to that point in a minute. McCown will be six years old than Hoyer when the season starts in September, which wouldn’t be bad except that Hoyer is already 30 years old. McCown will be 36 years old by the time training camp starts this summer, and if/when he starts a game for the Browns this fall, he will be the oldest quarterback to start a game for the team since the 38-year-old Don Strock in 1988. There is also the simple fact that McCown is not any better than Hoyer. You can make the argument that he’s not any worse, but there is simply no evidence that McCown is any better. So why make a sideways move like this? The biggest reason seems to be McCown’s willingness to take on a backup role with the Browns if/when the team finally settles on a quarterback. That is in contrast to Hoyer who, shockingly, wanted to be the starter. We know, crazy isn’t it? As Chris Pokorny at Dawgs by Nature points out, McCown’s contract pays a fully guaranteed $5.25 million for this season, but only has $1 million guaranteed for the final two years, making it easy for the Browns to cut McCown at this time next year. And when, OK if, that happens, McCown will join the likes of Jeff Garcia, Trent Dilfer and Jake Delhomme as quarterbacks the Browns have signed over the years as “bridges” to the next great hope at the position. The only thing is, those bridges always seem to lead right off a cliff. Then there is the whole concept of bringing “winning football to Cleveland.” We know that quarterbacks can get too much credit or blame for a team’s overall record, but the simple fact is that McCown brings a career record of 17-32 as a starting quarterback to town. That record includes last season’s disaster in Tampa, where McCown went 1-10 while posting a quarterback ranking that was just one spot above dead last in the NFL. 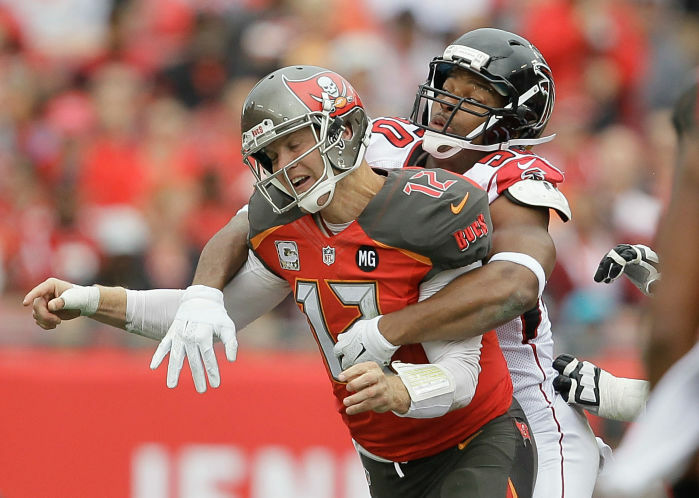 Included in that 1-10 record was an 0-5 record against the NFC South – a division that did not have a single team finish over .500 and one that the Browns went 3-1 against last season. How is that helping to bring winning football to Cleveland? We’ve always worked hard to try and understand just what it is the Browns are trying to do. Farmer and head coach Mike Pettine say they want to build a team that runs the ball and play defense? Sign us up! While recreating the 1985 Browns may be an odd way to win in today’s NFL, one of the funnest times we’ve had as a Browns fan was watching the team beat up on Andrew Luck and the Colts this past season. The Browns may have lost the game, but that day showed what this team could be with a bit more work and we liked it. That is why we have to believe there is more to the plan here. Even if the Browns had brought back Hoyer, he was never going to the longterm solution at QB1, so the McCown signing doesn’t really change that part of the equation. The Browns have to know that going into the season with a quarterback trio of McCown, undrafted free agent Connor Shaw, and the in-rehab-until-further-notice Johnny Manziel is not going to work. At least we think they know that … right?